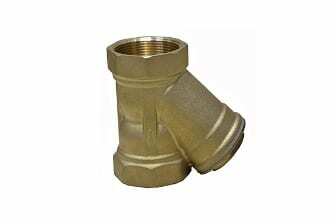 Our presence is widespread as an aluminium bronze Y strainer manufacturer, supplier and exporter for proffering the unmatched quality strainers attributing high strength, excellent corrosion and wear resistance. The offered Y strainer is made from the 9-12% aluminum and 6% iron and nickel material in order to convey excellently withstand capability against high temperatures and therefore is best suited to filter impurities from low pressure and high temperature surroundings without failing. This aluminum bronze Y strainer also shares resistance against corrosion, fatigue and deformation and hence provides longer life expectancy. The offered aluminium bronze Y strainer is designed and manufactured as per the ASME standards and also tested following the API standards in order to ascertain the leakage free performance of the respective. This aluminum bronze Y strainer is suitable for operational temperature ranging from 200° C to 452° C and operating pressure up to 150 psi and therefore is highly demanded in the cold water, oil, petroleum processing plants. The screen used in this Y type strainer is made from the 304 SS material, which we can provide in the different perforation size as per application requirement in India as well as other countries.